Bridal shower music can help create the atmosphere you're trying to achieve. This area is often overlooked in the planning stages. Choose selections that will reinforce your party theme and ideas. Take into account the bride-to-be, and/or couple's taste, and also the age range of those invited. In most cases, playing music softly, is sufficient. You don't want to overpower any conversations the guests may be having. There are also themes where you'll want to "turn it up", such as a Fiesta or Rock theme. • Theme party music is instantly downloadable online, and also available on CD's. You will have a variety of categories from which to choose. Familiar songs will definitely encourage dancing and singing. So, if this is your intention, pick some favorites that most people know. Again, consider the different ages. • Beach theme music... let your guests relax to the songs of Bob Marley, Jimmy Buffet, and the Beach Boys. • Broadway music...if she loves theater and show tunes, this is a great choice. • Country songs...if your party's "Gone Country" add these favorite hits. • Dance party music...if you want guests on the floor, pick lively dance melodies. • Luau party music... set the mood by choosing relaxing island themed instrumentals. • Wine bar...cool and easy classics reflect this theme. Is your party based around a specific decade? Then focus on a variety of popular songs, groups, and singers from that time. • 60's party...groove to the hit songs of Crosby, Stills , Nash, and Young, The Young Rascals, and Bob Dylan. • 70's Disco party...Donna Summer, Cool and The Gang, and Earth, Wind, and Fire, all had hits geared toward dancing. • 80's party... Madonna, The Bangles, and Culture Club will have guests singing along to their favorite tunes. from your favorite cds, or download the latest songs of your choice. 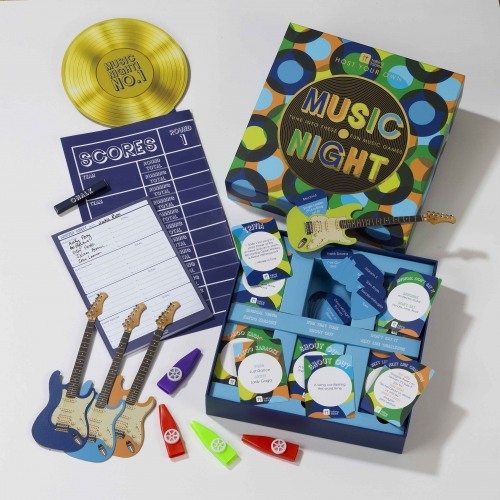 • Challenge your guests with this Music Night game kit. • Karaoke can be very entertaining, especially at a couples shower. Whether performing or watching, everyone usually gets involved, and has a good time. Use your judgement on the amount of time spent on this activity. Remember the true purpose of the party. • Piano player...taking personal requests. 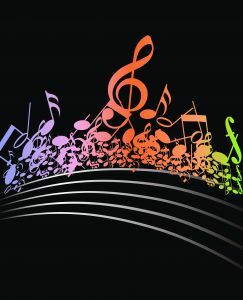 *** Whatever type of party you are having, blend in the bridal shower music to enhance your event. • Do you need ideas for party entertainment?